The fun doesn't end when the sun goes down here in Ludington! Even during the cold winter months, there are festivals to attend, cozy restaurants to visit, and local performances to enjoy. What better way to enjoy a balmy summer night than with music? We are blessed to have a variety of wonderful musicians in this area...from the Scottville Clown Band to the Pentwater Civic Band. 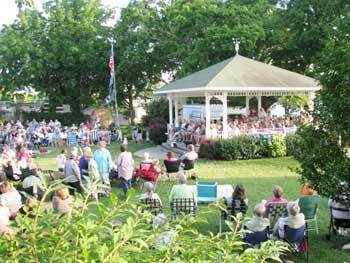 Venues for outdoor concerts include Ludington's Waterfront Park and the Rotary Band Shell at Rotary Park (formerly called Ludington City Park), the Scottville Clown Band Shell, the Shagway Arts Barn near Hamlin Lake, and the Village Green in Pentwater. 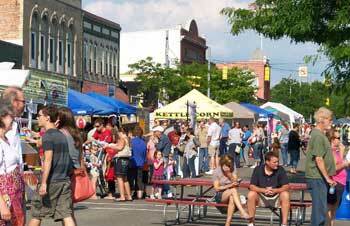 For four Fridays in July, downtown Ludington is blocked off for the famous Friday Night Live event. Plan to bring your appetite, as a number of food vendors will be on hand with tasty dishes. Kids can play in the bounce houses, have their faces painted, or enjoy an arts and crafts activity. The Baby Badger takes its little passengers on fun trips on Ludington Avenue or on an adjacent street. Music is going on at both ends and in the middle, so you'll always find something to your liking. Downtown shops are open late, and you can enjoy a meal at one of the family-owned downtown restaurants. Thursday nights in August, bring your blanket, flashlight, and popcorn and head to Rotary Park (formerly Ludington City Park) for Movies in the Park. A different family-type film is shown each Thursday night, and it's the closest thing to the old-fashioned drive-in theaters around. You may want to head to the beach in the evening hours to avoid the daytime crowds. Stop first and get an ice cream cone, then snuggle up on the sand and wait for the spectacular sunset that never disappoints. Make a game of it and predict the exact minute the golden orb seems to disappear into Lake Michigan. Ludington, Pentwater, Silver Lake, and Manistee all have great sunset locations along the shoreline. 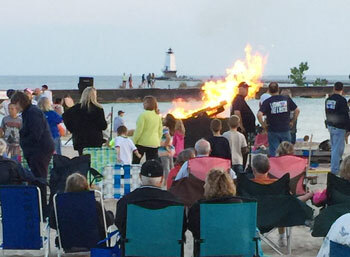 Ludington is having a Sunset Bonfire Series this summer on the 4th Thursday of each month. Dates are June 25, July 23 and August 27. Click here for sunset times. Have a picnic supper at Waterfront Park...there are plenty of tables, and while you eat, you can watch the various boats as they enter the marinas. 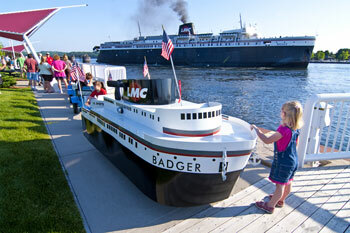 The S.S. Badger carferry arrives from Manitowoc at 7pm and leaves again at 8:30, and you'll have the perfect view. Kids can frolic on the playground, and after your meal, take a stroll to see the sculptures that are found throughout the park. West Shore Bank sponsors its Rhythm & Dunes Concert Series two Saturday nights in late July and early August--featuring top-notch musicians and free to the public. West Shore Community College is known for providing a great education to thousands of students of all ages, but the arts are also alive and well at the college. The Performing Arts Series features musicians, theater productions, one-man shows...as well as the WSCC symphony orchestra, jazz band, and concert choir. Click here for a list of upcoming events. The Manistee Civic Players are comprised of local talent that love to perform and have been doing so for 60 years. The productions, always entertaining and very professional, take place at the Historic Ramsdell Theatre in Manistee, a true architectural landmark. The Ludington Area Center for the Arts has proven to be a valuable and cultural asset to the city of Ludington. The Center hosts various concerts, exhibits, and speakers, as well as being home for the Lakeside Civic Players, a community theater group. The gift shop is open. Along Ludington Avenue and on South James Street, there are a variety of bars and pubs, many of which offer live entertainment on weekend nights. If karaoke is what you're looking for, you'll find that, too. Good friends and good times last long into the night...with taxis available for safe rides home. 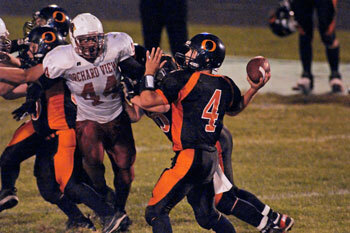 Fall means football, and Friday nights light up at Oriole Field. Prior to the game and at halftime, the Ludington High School marching band takes the field and fills the air with great music. Attend other outdoor sports, like cross country, tennis, and golf. Or stay warm inside and watch a volleyball match or a swim meet. Meet friends at your favorite tavern on Saturday or Sunday afternoon for exciting college and NFL football. When the weather is less than ideal, there's no need to sit home. Head out to a local bowling alley for a game of cosmic/laser bowling, or catch a movie at the local theater. Local coffeehouses are a great place to enjoy a beverage and perhaps catch some live entertainment. Many restaurants are open late ready to serve hungry patrons. 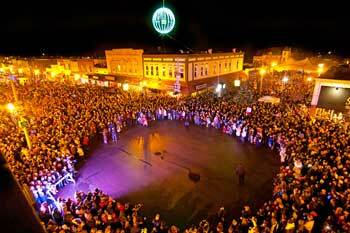 There's no better way to end the year than with a night in Downtown Ludington for the New Year's Eve Lighted Ball Drop. Visitor or resident...young or old....everyone can truly enjoy the night life in Ludington.